This review is for the Luxor double sided magnetic portable whiteboard. 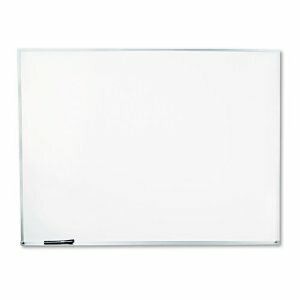 This is a large dry erase whiteboard that has a surface area of 12 square feet with dimensions of 48″ by 36″ by 1″ deep. 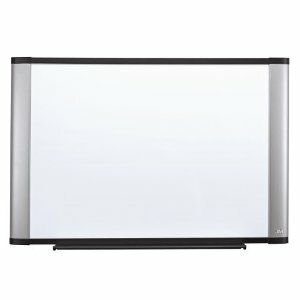 The Luxor whiteboard comes in an attractive white motif with aluminum holders and bars accented with black. This unique large white board features a magnetic surface on both sides. This can be utilized to make the board into a calendar, planning area, timesheet, or used for attaching documents to the surface. Additionally, this double sided magnetic whiteboard comes with a stand and wheels, making it very portable and great for use in the office or classroom. There are many options available to extend the use of a whiteboard when the underlying surface is magnetic. The board is set on a stable mount that has a 4 wheel system. 2 of the wheels can lock-out, providing for a “brake” system that will help to keep the whiteboard in place as it is being used. Other systems do not come with this feature and can be difficult to use on floors that do not offer much resistance (the board will move or slide when in use if not against a wall). Having a double sided whiteboard also gives you more opportunities to expand on your brainstorming, lessons, or meeting notes. With a one sided whiteboard you would have to stop, take notes or a picture of what you have done, erase the surface, and then move on. With a double sided board like this one you can easily flip it over and keep going – very handy! The Luxor whiteboard comes with a standard tray for whiteboard markers that is attached along the bottom of the whiteboard (but separate in order to facilitate easy flipping of the board) and has lock out that hold the board in place after being flipped. These extra features do add to the price; however, if you are looking for a full featured board with excellent features and lots of utility this might be the whiteboard for you.